The Kite is a slightly modified version of the Osprey, with the only difference being the tumblehome section. On the Kite, the chine sweeps gracefully all the way from the tip of the bow to the tip of the stern. But what a difference this makes!!! All of the handling characteristics of Kite are identical to the Osprey, but, to my eye in any case, the looks are far superior. Running the chine all the way to the ends results in the gunwales in the bow and stern quarters being closer together, with a narrower "eve" for the decks. Although the hull below is the same old Osprey we know and love, the look is sleek and fast. Although there are a few 'tricks' to planking the chine, which we show you with the plans, it is actually easier overall to build than on the Osprey. On that canoe, the chine has too transition smoothly back into the straight sides of the hull, and this transition can be difficult to do well. The gorgeous cedar strip canoe in the photos above was the prototype, and it featured a painted outer hull, with a natural cedar strip finish inside. The natural interior provides a lovely contrast to the exterior, which looks like a top-quality factory finish. This is a great alternative when the wood strips are not the most attractive colour or grain. These photos really show off the sleek lines of this fast, quiet tripping canoe, as well as the graceful seat design, which is the perfect finishing touch for your hand built masterpiece. This seat design is a Green Valley exclusive, and can be seen in more detail here. Also note our custom removable portage yoke system. This solo was also rigged for floatation bags, although the bags are not shown, and, a Suunto compass fitted into the forward thwart. There were other custom details too numerous to mention. As a side note, this particular canoe was displayed at the Wooden and Antique Boat Show in Gravenhurst the day after it was completed - and it sold on the spot! I never even got to put it in the water!! What John Winters wrote about the Osprey, applies equally well to the kite: "The Osprey was originally intended as my personal boat. 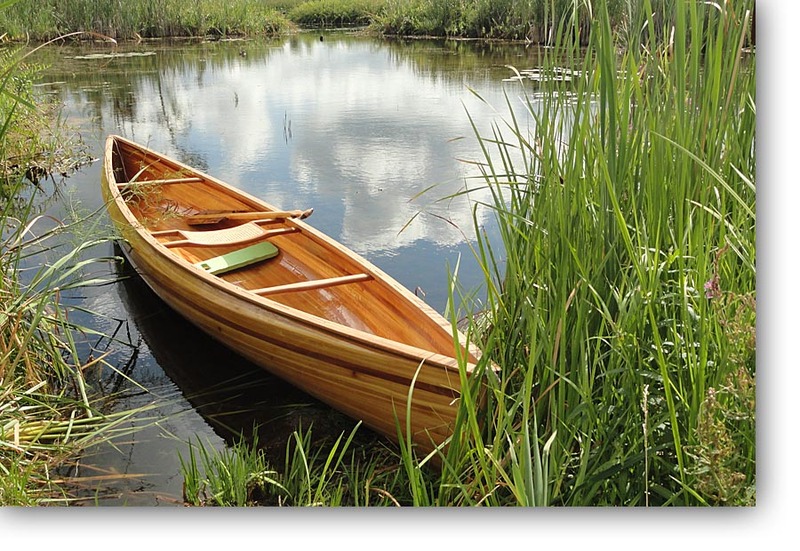 It is what I perceive to be the ideal small solo canoe for Canadian wilderness travel. The designed displacement is adequate for a large paddler on a week long trip, or a smaller paddler for longer trips. Unlike most American solos, this boat is heavily rockered forward with slightly less aft. The combination provides good maneuverability in smaller streams and excellent tracking on open water. Despite its relatively low freeboard, it is a dry boat (I have paddled the north shore of Lake Superior in it without taking on more than a few small dollops in the most severe conditions one would like to paddle in) and the sculpted tumblehome midships allows good stroke mechanics despite the boat's 30 inch maximum beam." New!! The plans for the Kite now include full-sized paper templates of all stations, on three sheets, as well as the original CD! The rich amount of detail on the Osprey plans isn't on the Kite templates, so PDF's of the Osprey plans are included on the CD for reference, along with lots of extras, including step-by-step photos of how to strip the chine, making this once tricky step fairly easy. All photos above courtesy of Kim Viney. This photo is one of our customers' Kite, in the Pigeon River near Omeemee. Return to see other available Models.